One of the summit's panels will cover the growing trend extensively, with leading executives sharing hands on experience. Multi-asset trading offerings have helped redefine broker’s services suites, given a confluence of versatile trading instruments and mounting popularity from traders worldwide. 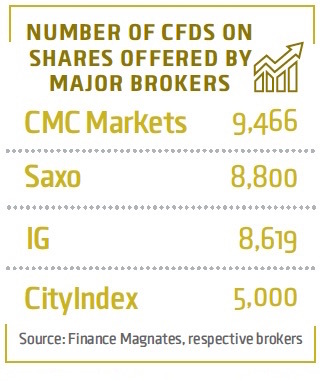 In particular, over the last couple of months many brokers have expanded their existing offerings with contracts-for-difference (CFD) utilities, owing in large part to an uptick in the instrument’s use globally. Our latest Quarterly Industry Report (QIR) has provided unique data from brokers, and the upcoming Finance Magnates London Summit will gather a host of experts to shed light on the nitty-gritty to-dos of Multi-asset trading. Secure your seat at the trading industry’s leading event! The panel will feature some of the most notable thought leaders from the industry: James Watson, Managing Director of ADS Securities; Kurt vom Scheidt, Exclusive Director, Global Head of FX Exchange, Saxo Bank; Cyril Tabet, Partner and CEO, JFD Group, and Brandon Mulvihill; Global Head of Institutional Sales at FXCM. ADS Securities is the latest entrant to the Multi-Asset space. After reviewing the success of assets such as US and European indices, oil, gold and silver on the MT4 platform, it has decided to add them on it proprietary OREX product. It will be interesting to hear about immediate lessons learned, along with veteran industry players’ reflections. The endorsement of a broader portfolio is imperative in the competitive retail forex landscape, and the panel will highlight key issues and provide hands on takeaways. Stay Tuned!